← Alive with Clive Makes Fundraising Fun for Charities! Several months have elapsed since I last published a Blog post on this Blog. If you’ve been to this Blog before, and if you scroll through previous posts and the archives, you’ll see that it has been devoted primarily to news about Alive with Clive, The Alive with Clive Top 20 and posts about ways in which synergistic philanthrocapitalism can be used to enhance the way companies do business so that everybody wins. Over the winter and spring of 2013 into 2014, the Web site for Alive with Clive at http://alivewithclive.tv was revamped, and so news and information relating to Alive with Clive and The Alive with Clive Top 20 is now being published at that Web site. In addition, I own the domain for synergisticphilanthrocapitalism.com, and updates about synergistic philanthrocapitalism will be posted there in the future. I nevertheless do want to reiterate here, before I tell you more about the brand new look and direction for Clive Swersky’s Blog, that I recently announced the creation of The 1st Alive with Clive 10K Charity Extravaganza, in which I plan to put the principles of synergistic philanthrocapitalism into effect to raise $10,000 in a crowdfunding campaign to distribute to charities that encourage their supporters to enter contests involving shows featured on Alive with Clive. Additional information about this endeavor will thus be provided at the Home Page for Alive with Clive. If you represent a charity, to participate in the 10K Extravaganza, click here. And if you represent a company, to participate in the 10K Extravaganza, click here. What Would Be Outstanding Branding? Now that the Web site for Alive with Clive has been revamped, I have realized that I am bursting with additional ideas to share, implement and express in the world in pursuance and fulfillment of my promise for the world, which – stated succinctly – is to create an upward spiral of brilliance and joy in the world! Over the past several months, I’ve given a great deal of thought to the subject of branding. Do I brand myself as Alive with Clive exclusively? Do I brand Clive Swersky as well? If so, how? In reflecting upon these questions, I’ve realized I still don’t have all the answers – just additional questions combined with lots of passions and interests. In reflecting further upon all the ideas I want to share, implement and express, I realized that they fall within the broad category of Health, Wealth and Wisdom. So in the top right-hand corner of this Blog, you’ll see that this Blog is now going to be devoted to Talking Health, Wealth and Wisdom. In case you didn’t know, several weeks ago I launched a Facebook page called Talking T-shirts, Mugs and Gifts, and so I decided to adopt the same line of thinking by adding the word Talking in front of Health, Wealth and Wisdom for this Blog. And I’ve also created a Facebook page called Talking Health Wealth and Wisdom, which I’d love you to “Like.” So please go to Talking Health, Wealth and Wisdom on Facebook to Like the page, and while you’re there, please also Like Talking T-shirts, Mugs and Gifts too. I’ll be most appreciative if you do! Thank you! And, since I love to harness the power of synergies, by now you might have gathered that I will be harnessing the synergies that are created by having my activities relating to Alive with Clive be in a dance with whatever I create around Talking Health, Wealth and Wisdom and Talking T-shirts, Mugs and Gifts, as well as my other endeavors! 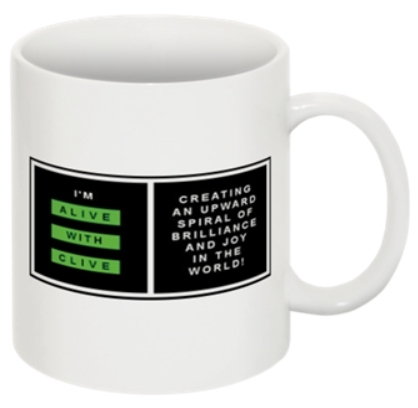 Speaking of Mugs, I still have a few Mugs with the previous Alive with Clive logo left. This attractive Mug with the inspiring message is destined to become a precious collectors’ item, since there are – literally (and here I must take a time-out to say thank you, Cassandra Kubinski! Whenever I use that word, or hear it, I think of her and her song, “Literally,” which you’ll find here) less than 100 in the world! And you can win a set of four (as well as three of Cassandra’s CDs, plus nine others) if you enter the current Alive with Clive Contest here. While I don’t yet have the exact date for the end of this current contest, it’s likely to be ending soon because of other plans I’m itching to implement, so make the most of your opportunity to enter the contest to win the set of four Mugs and other prizes while you still can. That’s It For Now, Already! OMGGM – oh my goodness gracious me – this Blog post is already so long and I haven’t even begun to share any of my new ideas! No worries. I’ll be sharing lots of news on this Blog in the days ahead. Before I say goodbye for now, though, I do want to mention that on my journey of building Alive with Clive into the brand it is with the online infrastructure it has today, and in my experience of overcoming a major life-threatening illness, I’ve encountered several amazing people and products. One internet marketer, in my view, stands head and shoulders above the rest, and I’ll be telling you more about him soon. Also, I’ve encountered two health-related products that I regard as essential as a toothbrush, and I’ll be telling you more about them, among others, soon too. In the meantime, though, you’re likely to find clues about the above-mentioned extraordinary internet marketer and products, and be drawn to other appealing gems, if you go to the brand new Resources page on this Blog, which you’ll find when you click here. In the future, too, I’ll be converting this Blog into a fully-functioning Web site under the domain, www.cliveswersky.com, and it will become the hub for all the exciting events that are about to occur in the world of Clive Swersky and Alive with Clive. Until next time, make every day a magnificent experience and bring your passion to life! This entry was posted in Clive's Perspective, Uncategorized and tagged Alive with Clive, Alive with Clive 10K Charity Extravaganza, Alive with Clive Top 20, branding, brilliance and joy, Cassandra Kubinski, charities, Clive Swersky, crowdfunding, gifts, health, Inspiration, Literally, Mugs, Resources, Set of 4 Alive with Clive Mugs, synergistic philanthrocapitalism, t-shirts, treasured collectors' item, upward spiral, wealth, wisdom. Bookmark the permalink.